Here are some facts about the Brooklyn Bridge. The Brooklyn Bridge spans the East River in New York City. It connects the boroughs of Manhattan and Brooklyn and was declared a National Historic Landmark in 1964. The bridge was opened in 1883 and it was the longest suspension bridge in the world for 30 years. Its main span measures 1,595 feet across. The bridge weighs almost 15,000 tons and contains about 15,000 miles of wire. Each of the 4 main supporting cables is almost 16 inches in diameter. The bridge’s opening celebrations included fireworks, a gun salute and a musical performance. The first person to cross the bridge was Emily Roebling, the wife of the bridge’s designer. It takes about 30 minutes to walk the mile long length of the Brooklyn Bridge. Walking across the bridge at a moderate pace burns about 100 calories; walking slowly burns about 80. In 1884 the showman PT Barnum led 21 elephants across the bridge to show that it was strong. In 1901, a man was sentenced to two years in jail for ‘selling’ the bridge to a tourist. In May, 1883 a rumor was started which led the crowds on the bridge to believe the bridge was about to collapse. At least a dozen people were killed in the resulting stampede. On the first day it was open, over 150,000 people and 1,800 vehicles crossed the Brooklyn Bridge. Today about 150,000 vehicles cross the bridge each weekday. The Brooklyn Bridge has become one of the most famous sights in New York. It also features in dozens of movies, including Spiderman, Moonstruck and The Siege. 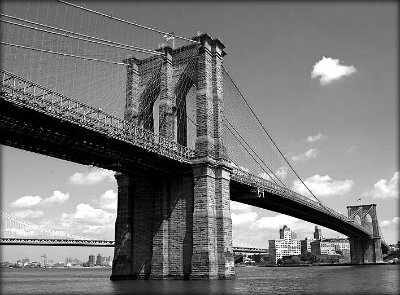 The Brooklyn Bridge is the symbol for an Italian brand of chewing gum. It has also been used to advertise many other different products. I have a particular interest in the Brooklyn bridge. My father, a New York ironworker, fell to his death while working on the bridge In 1957. I can never find any info on people who lost their I lives other than those that built it . great facts! my teacher will be proud of my wonderful facts! Thanks!